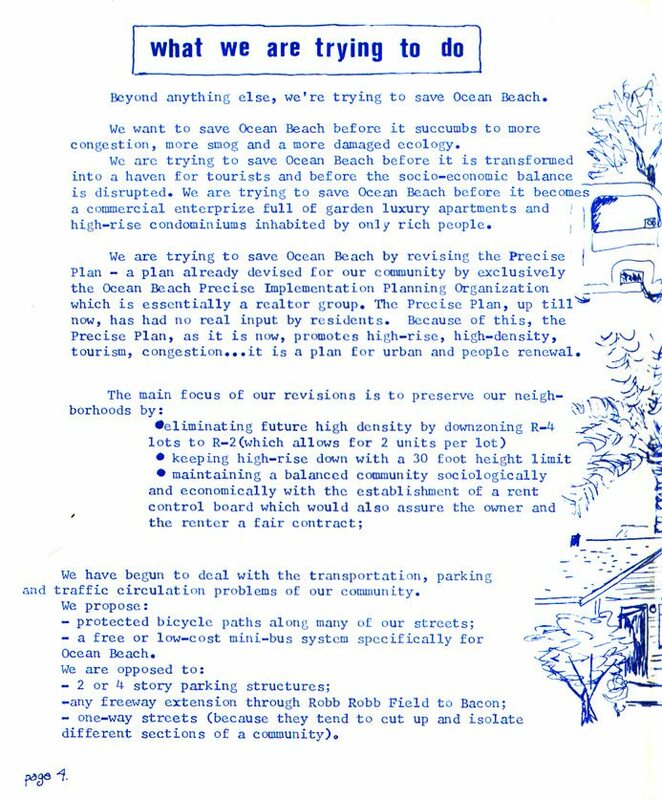 In the early Seventies, the battle for the future of Ocean Beach grew very intense, as the different warring sides squared off around the original OB Precise Plan – the urban design for the community sponsored by the elite and powerful. 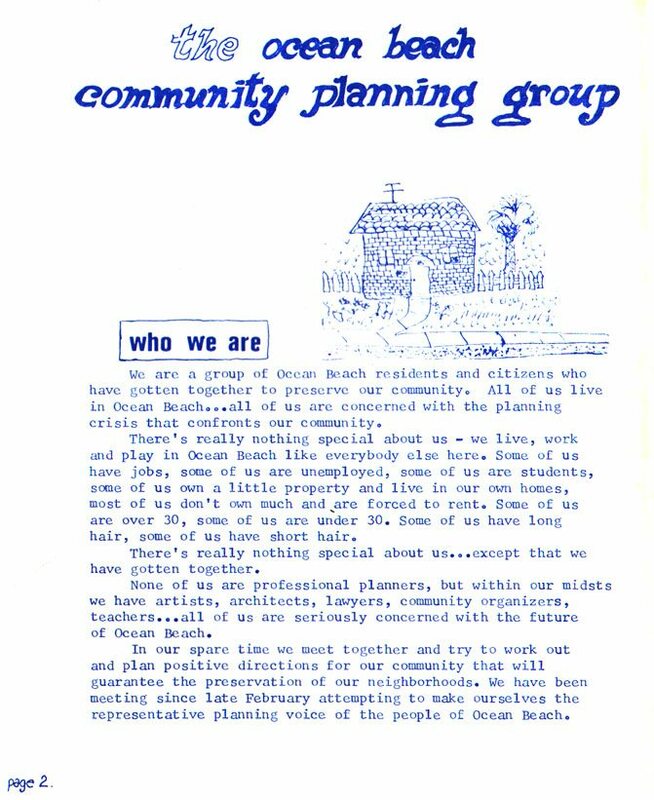 Residents, tenants and single-family homeowners rallied and formed their own organization: the OB Community Planning Group (CPG). 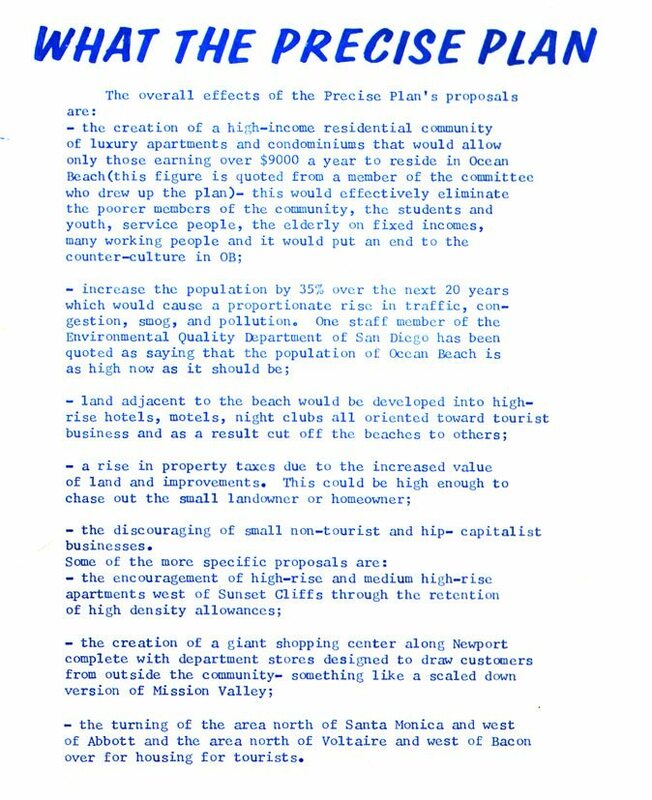 CPG published an 8-page leaflet that was so effective, that it convinced the community to join and support the organization. 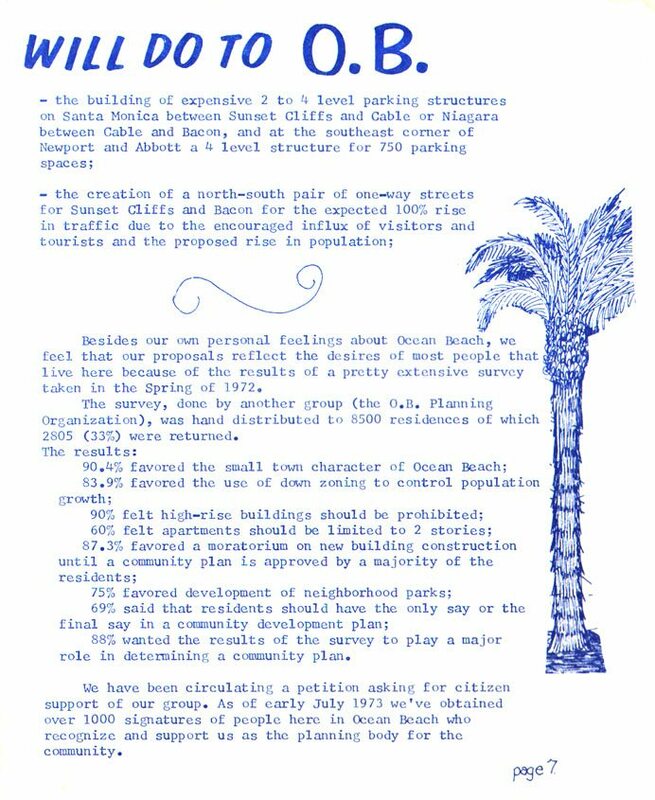 Several thousands were printed and reprinted and distributed throughout OB for several years. Here it is, republished in its entirety. As it was a folded brochure, the center-fold and some of the other pages were viewed together, so keep that in mind. Remember these images are 35 years old, a little fuzzy, and we apologize in advance, because the text is difficult to read. 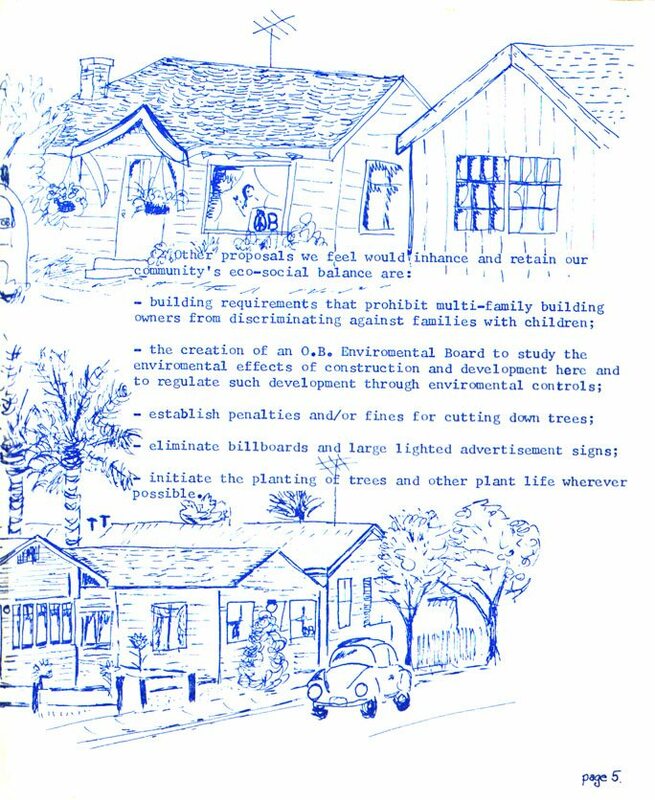 Many of the drawings are of actual buildings, most of which are still standing. Hey, great! 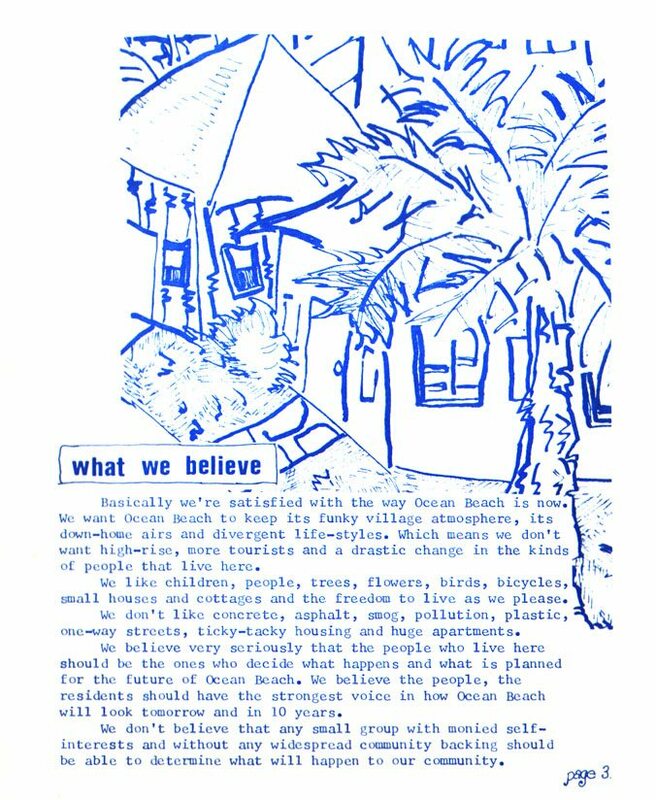 I remember this leaflet! It is difficult to read, however. A magnificent manifesto! The “who we are” and “what we believe in” is as fresh, straightforward and relevant today as it was 30 years ago. Very cool! Thanks again for bringing some of the older stuff to life! We must remain vigilant or our village could be easily swallowed up by heartless, soulless corporate greed. 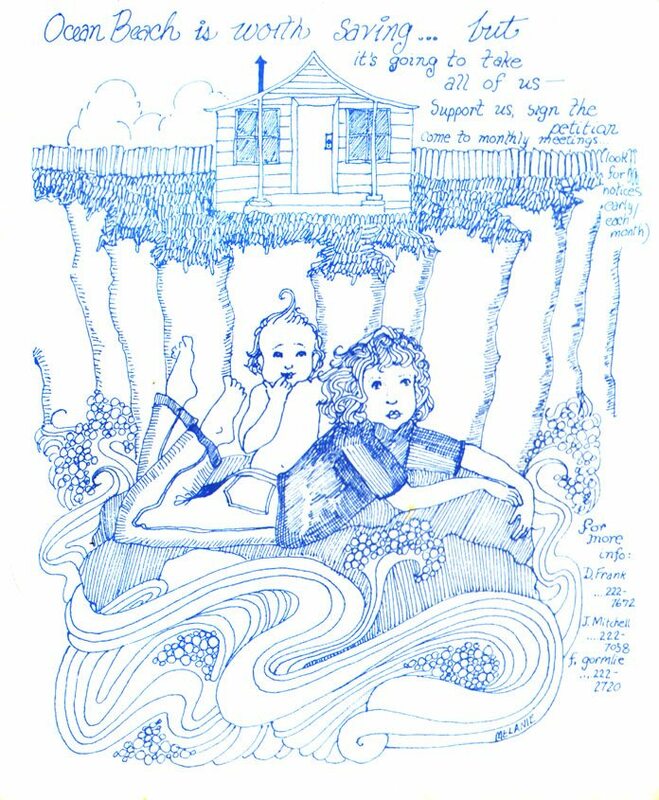 Frank, did the same person do all of the illustrations? They’re great! This is a pretty detailed and very well done document. Does anybody know who put it together? also, I’m seeing a few different artists doing the illustrations. I’m real curious as to the making of this brochure. How many of those folks are still around? Dave and Gary – I was on a committee that put it together. I wrote most of the text, and was one of 4 artists. Melanie – and I forget her last name – did the wonderful cover and back. John Lyons, who did the original masthead for the OB Rag, did the coverpage ‘masthead’. My drawings contribution are in the centerfold – pg 5. BTW – Patty photo-shopped the original flier, so now the quality is ten times better. Great job on the brochure, Patty . . . I was afraid I was going to have to offer to do it . . . and I am phobic about photoshop . 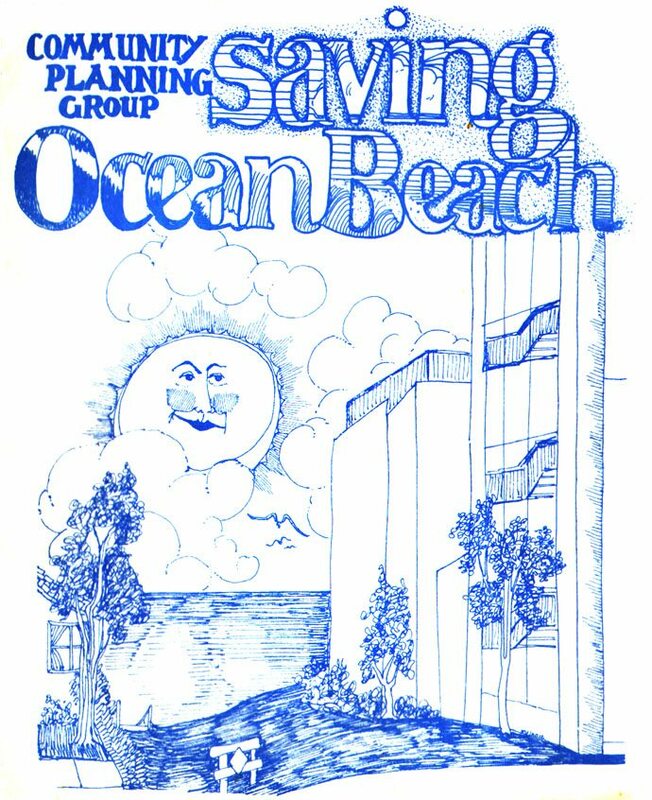 . .
this brochure, and the struggle it represents and evokes, was a big part of my first year in OB, as was the Rag. It fills me up to see such materials as relevant today . . . and you know, they are!!! This is as timely now as it was when it was written. Only a few details have changed.